The seat of Bentleigh is marginal, so we’ve been getting a lot of attention. 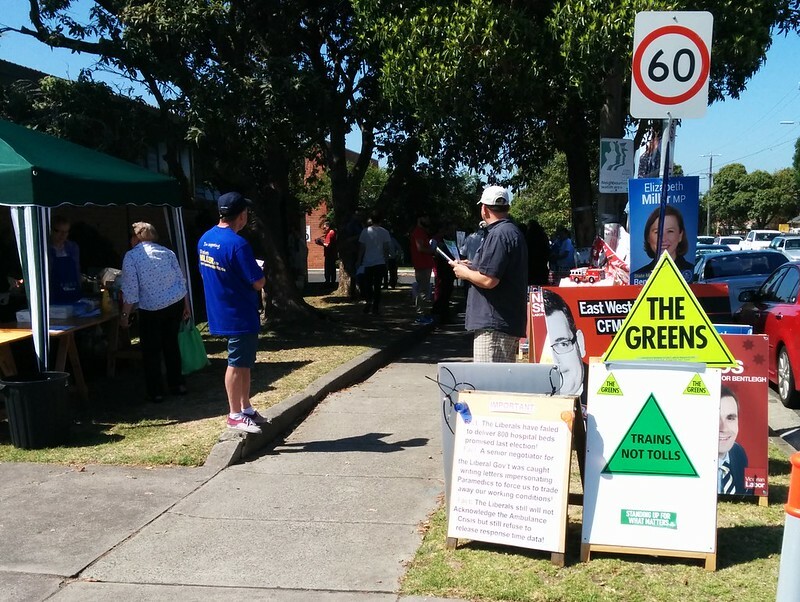 The booth I usually vote at leans towards the Liberals (or at least did in 2010), so we had Labor politicians galore: local candidate Nick Staikos, along with Federal Labor leader Bill Shorten, and Labor luminary Simon Crean. Independent candidate Chandra was also present. A mass of How To Vote cards were thrust in my direction. I usually reject them, but this time around I was interested to take a look. Sneakily, a new local souvlaki restaurant slipped their flyer in as well (their people had “Souvlaki party” t-shirts). Together with the ballot papers, it made for a lot of paperwork. The decision had to be made who to put last, of course. My rule is usually: racists are worse than nutters, who are worse than those with policies I disagree with. 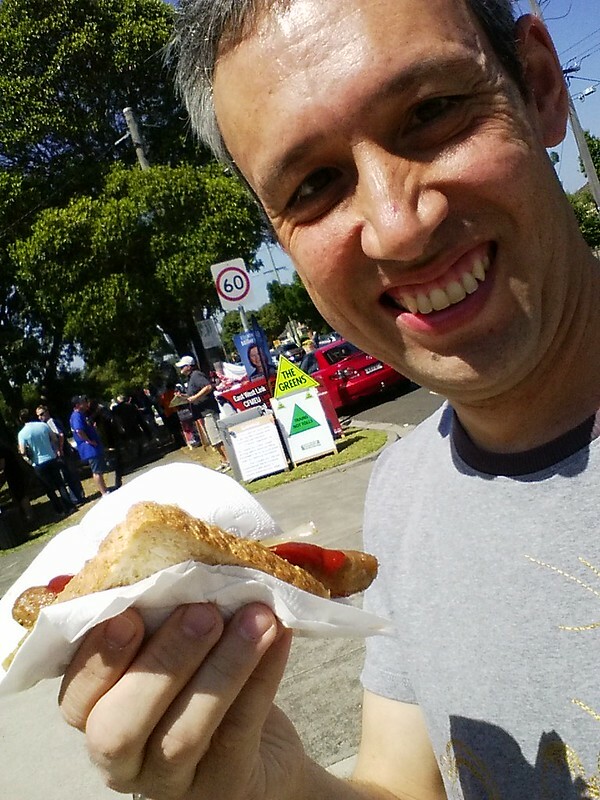 Voting done, I looked around the jumble sale, cake stall, and then wandered outside for that most Australian of election traditions, the sausage sizzle. My kids were rather unimpressed that the Liberals preferenced the Greens after Rise Up Australia. Isaac voted. Jeremy’s not old enough to vote yet, but will be next time. Meanwhile though, he put together this short video… apparently if elected, Labor will be all about pudding. Next → Next post: Election wrap-up: Counting continues, East West Link, and Pudding! I think Jeremy has the right idea – I’ll vote for pudding any day. Now Jeremy’s video clip is featured on The Age website. Hilarious! Are we too soon to declare Labor as winners, given that 30% of the votes are yet to be counted? Unless a candidate can get past the post on first preferences only, it is just too early to call. Then again, I guess that many of the candidates have in fact won on first preferences only. Well, I hope this means a decent improvement to SmartBus network. Hope to get some decent SmartBus, Brand new routes out my way in the Narre Warren area, and I am going to campaign hard for that to happen. The Liberal party has let us down greatly in respect to public transport. 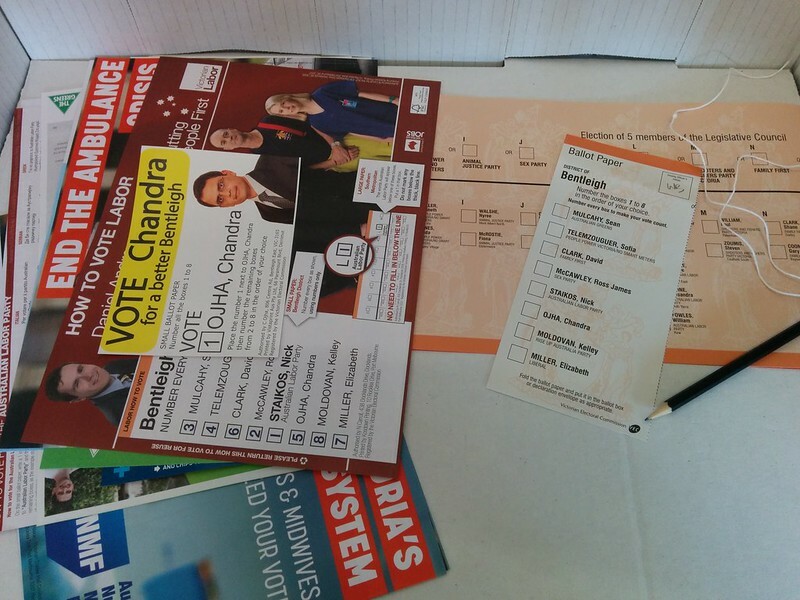 I think I only had four candidates to vote for in my seat of Narre Warren South. Hard to remember as I did an early vote on last Monday. No, I did not stand myself this time, as I was not able to get the application fee in time. We are a safe Labor seat anyway. We need at least three, if not five decent SmartBus routes in our area, and we need them big time.